22nd June 2015: For a limited two week run, Whose Line is back on UK turf and is doing comedy proud. Hosted by Clive Anderson, all the games from the original TV show are here, played out with audience interaction. WLIIA has been and still is a huge success, wether it is re-runs on UK TV here on Dave, Dave Ja Vu or Dave +7. In the US it was even bigger with Drew Carey presenting, and it is currently on its second network over there. Anderson is very quick witted, his opening monologue littered with jokes including a funny take on Greek yoghurt. 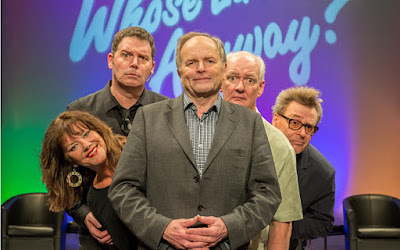 He introduces the improv comedians, and they are the finest around... Greg Proops, Brad Sherwood, Colin Mochrie and the amazingly talented Josie Lawrence. What makes Whose Line work incredibly well is the amount of quick thinking on the spot comedy from these performers, it is remarkable how they come up with ideas instantaneously and keep the show fresh. Film and Theatre Styles kicks off the games, and all the old favourites are thrown in, 'Worlds Worst', 'Standing, Sitting, Bending', 'Alphabet game' and many more. But what stands out are the music rounds, both Josie and Brad are masters of these, wether it be an opera about security guards, or a love song about Julie-Anna the stage management student. The Irish Drinking song and Hoe Down are also there and are very funny. In the interval you can write down obscure lines for a game later in the show, and there is a props game where two volunteers are asked to come up on stage and have the contents of their handbags used during a scene, resulting in hilarious consequences. Even a faulty radio mic is destined for some on the spot madness. Overall, an incredibly funny night out, and it's only here for two weeks, so grab a ticket if you are lucky enough, as it is selling out fast.